I am in love with many different aspects of fitness — from weight training to boot camp classes to trail running, I'm addicted to the way exercise makes me feel. My philosophy is that it’s not about spending your life in the gym; it’s about a little time in the gym to enjoy a lifetime outside. Throughout all the highs (#gainz) and lows (dropping a weight on my foot and breaking a toe), one personal favorite aspect of fitness that always compliments everything else I’m doing is yoga. Yoga, originally an ancient Indian spiritual tradition, has become extraordinary popular in western culture over the last ten or so years. I’m not sure if it’s due to trendy Lululemon tights or Instagram accounts full of toned babes showing off impossible poses, but either way, yoga has arrived, America. For years I wanted to try yoga. It seemed a little intimidating for some reason — not because I thought it was difficult but because I didn’t really understand it. A year ago I took my first yoga class (hot yoga, believe it or not) and over the course of the following months I began practicing a few times per week. Before long, I was completely in love with the way it made me feel, not just because it was incredibly relaxing but also because I began to notice benefits in real life. I could balance better while snowboarding, I became incredibly flexible, and my post-weightlifting stretches became less and less necessary. Note: I do not advocate skipping stretching before or especially after a workout. I do however believe that yoga helps with flexibility and muscle lengthening, so stretching will become easier with time if yoga is practiced regularly. If you’re thinking about becoming a yogi but not sure how to start, here are 9 steps to help you break into a regular yoga practice. Get ready to feel amazing! 1. Start in the comfort of your living room. If you live in a city, there are probably a bunch of yoga studios around. Do a little bit of research and read Yelp reviews. Oftentimes yoga studios have really great introductory offers for beginning students, with no obligation to join later. If you already attend a gym that offers classes with no extra charge, that can be an appealing option too. If the class is donation based, bring a little cash for the instructor. 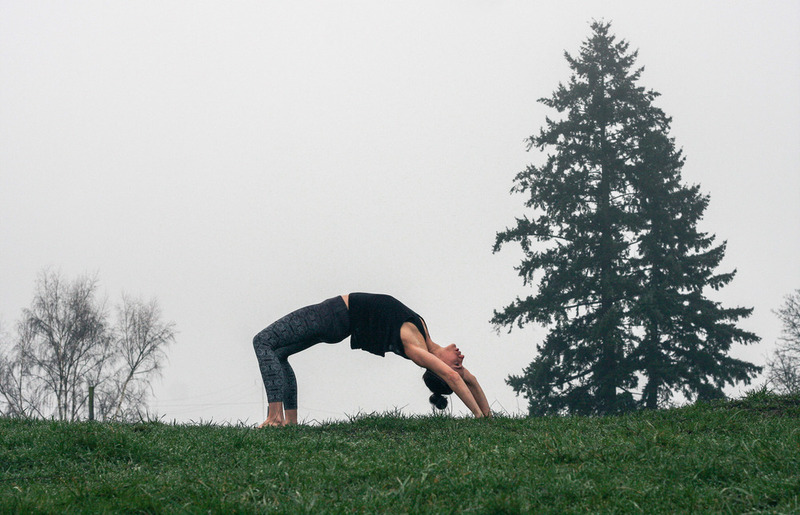 If you live in Portland like me, I recommend checking out the free classes at prAna and The Lotus Seed, or taking advantage of the amazing intro deal at Hot Yoga For Life. 3. Choose the middle of the classroom. 4. Move at your own pace. The great thing about yoga is that it is a practice. Yoga utilizes a truth you should implement into all areas of health and fitness: everyone is on their own journey, and your progress should never be compared to where someone else is at. Pay attention to your body and move at your own pace. Yoga does force your muscles to settle and relax into deep stretches which is VERY good for you but may feel a little uncomfortable at first if you’re not used to it. Mild discomfort is different from pain. Always pay attention to what your body is telling you and modify a pose if you need to. It’s totally acceptable to tell the instructor at the beginning of the class that you’re new to yoga — they can help you with modifications during the class. Don’t be afraid to get into child’s pose and allow your body to relax if you need a break! 5. Yoga is stretching by uniting your breath with your movement. Yoga is many things to many different people, and if you adapt it as part of your exercise routine, you will find what kinds of yoga work best for you and your lifestyle. But to me, at the end of the day, yoga is simply a great way to statically and dynamically stretch my muscles and unwind while intentionally paying attention to my breathing. Yoga literally cleanses toxins from your body and may be particularly beneficial after a long weekend of binging or stress. More active forms of yoga, like Power or Bikram, will have your body moving and sweating, burning calories and toning your muscles. It can be a fantastic workout. Vinyasa Flow is probably one of the most common forms of yoga which also involves linking movements together but isn’t quite as active, whereas a meditative or restorative class will be slower and focuses more on breath and long poses — still a great way to detox and cut stress but won’t burn as many calories. Try a few classes and see what works best for you. Make sure to flush your body out with a ton of water before, during, and after your yoga session. If you decide to check out hot yoga, this is especially important. I cannot emphasize this enough. Drink up! 8. Yoga isn’t a fashion statement, it’s a healing practice. While you should wear comfortable, moisture-wicking clothing, do not feel like you have to shell out a ton of money to practice yoga. To this day, one of my favorite pairs of yoga pants is from Target! Because yoga wear is becoming more and more en vogue, brands like the Gap and Old Navy are creating affordable fitness lines with decent options. I am a full believer in the mantra “look good feel good,” however I don’t think this always requires shelling out a ton of money for workout clothes. If you want to invest your cash somewhere, get a good yoga mat! I use the biodegradable E.C.O. mat from prAna and I love it. 9. Make it a routine. Don’t feel like you have to do it every day, but creating a routine and practicing yoga regularly is a fantastic way to increase your flexibility and balance, which will aid in everyday activities. I usually practice yoga 2-3 times per week. Typically, I like to do it first thing in the morning. Find out what works for you!